Child Tea Party Recipes - Foods For Kids and Family! Foods For Kids and Family! A selection of 6 child tea party recipe ideas to host your perfect children's or kid's party! I love preparing for a child tea party! All the little cakes and tiny sandwiches – pinwheels and fondant fancies, the excitement and fun of choosing cheese and pineapple to go with iced biscuits! All the normal rules for feeding kids go out the window and we indulge our sweet tooth. I always try to get my kids to join in the preparations so the whole family is involved – it doesn’t always look as pretty as if I had done it myself, but it is a whole lot more enjoyable. 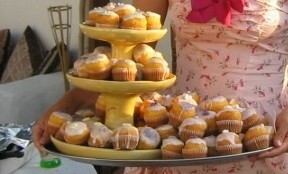 Here are a selection of my child tea party recipes. Enjoy! Step1. Cream the butter and sugar until frothy. Step 2. Add the eggs and vanilla and beat. Step 3. Use another bowl to mix the dry ingredients, then add to the wet mixture gradually, stirring firmly. Step 4. Add extra flour if it is a little sticky. Step 5. Roll into a ball and refrigerate for about an hour. Step 7. Roll to about ¾ cm thick and cut out shapes and place on the baking trays. Step 8. Bake for about 10-15 minutes and cool on a wire rack. Step 9. When cool, mix up the icing sugar and a little water or lemon juice and separate into little bowls, add different food coloring to each bowl and decorate with as much as you can – see pictures! Cheese and Pineapple – a much forgotten winner at child tea party! Step 1. Chop the cheese and pineapple into 1 inch chunks. Step 2. Put a piece of each onto each cocktail stick. Step 4. Push the cocktail sticks into the melon until it resembles a large hedgehog. Ahhhhh the memories! And it is a really good mix of flavors that kids love – it will probably be the healthiest thing on the menu. Fillings: Cream cheese, ham, peanut butter and jam, marmite, chocolate and hazelnut spread, houmous, egg salad (very fine), grated cheese and mayo, tuna and mayo… whatever you like really! Step 1. Remove all the crusts of the bread and keep the pieces as square as possible. Step 2. Gently roll out each slice so it is flatter and firmer but not squashed to the board! Step 3. Spread your filling neatly into each corner but not overhanging. Step 4. Roll the slice into a roll and wrap in cling film, place in fridge. Some fillings will require a cocktail stick to secure them – ham and other larger fillings. Step 5. Just before serving, remove from fridge and cut into rings, place on the serving dish swirl side up for maximum color and effect. I find that kids that are usually really fussy will eat these as they look so beguiling. No child tea party would be complete without fairy cakes, the more garish the better, they are so easy to make and look so colorful on the table – really worth the effort! It couldn’t be easier – this is a classic all in-one-recipe so even the most nervous cook can attempt these with success. Step1. Preheat the oven to 170 degrees/gas 3. Step 2. Sieve the flour and baking powder into the mixing bowl – make sure lots of air gets in. Step 4. When the mixture drops off the spoon, add a dollop to each cake case (placed in a patty tin). Don’t add too much or they will rise too high – you want them to just reach to top of the cake case or all the icing will ooze off. Step 5. Bake for 15 to 20 minutes, until they are slightly golden. Step 6. Cool on a wire rack. Step 7. When cool, make icing by creaming the butter and sifted icing sugar together. 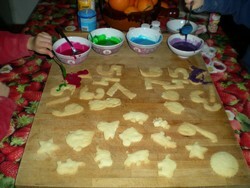 Add your coloring – if you want lots of different colors, then split the icing into several bowls and color accordingly. I always feel that for child tea party, the more gaudy colors the better! Step 8. Top with silver balls or little sugar flowers, there are so many wonderful things to choose from these days, you can theme them to the party – chocolate footballs, fairy dust, gold balls… have fun making them as pretty or as loud as you can! Sausage Rolls – no child tea party would be the same without them. Step 1. Cut the fat into cubes and rub into the flour, incorporating air as you go. Step 2. Add 3 tablespoons freezing cold water and stir in with a knife, then using your hands bring together into a dough. Add extra water as needed. Step 3. Refrigerate for half an hour, wrapped in cling film. Step 4. Preheat the oven to 200 degrees/gas 6. Step 5. On a well-floured board divide the mixture into 3 equal pieces and work with them one at a time. Step 6. Roll each into a long rectangle about 30 cm long. Step 7. Again, divide the sausage meat in to 3 and roll into, well sausages! Step 8. Place each sausage onto the pastry – make sure the pastry is a bit longer. Brush milk along the edges of the pastry. Step 9. Roll the pastry over the meat and join using the milk – trim off any excess but leave a 1cm overlap seam. Roll the sausage roll over so it covers the seam and cut to your desired length – I suggest 5cm for children. Step10. Place on the greased baking tray, seam down, pierce with a fork for decoration and aeration and brush with milk for a lovely shine. Step 11. Bake for 25 minutes until golden and crispy. Chocolate Crispy cakes are wonderful for kids, they are easy and you can add dried fruit to make them a little healthier. Step 1. Break the chocolate into small pieces and put into a glass bowl. Step 2. Put the bowl on the top of a water-filled saucepan and heat the water, stirring the chocolate as it melts. Step 3. Add the syrup and butter and heat until mixed and melted. Step 4. Add the puffed rice and mix well. If you want to add dried fruit such as raisins or chopped up apricots, add them now. Step 5. Spoon into cake cases and leave to cool and set. These are so appetizing, you will have to watch the attending adults or they will all be demolished in a matter of minutes. All child tea party recipes should be simple and fuss free – kids are not interested in fine dining but love brightly colored mini foods that pop into the mouth. 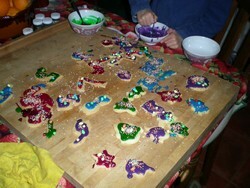 If you make the food fun, I find that the kids behave better.